Helping to make risotto was one of my favorite kitchen duties as a kid. I was the chief stirrer, tasked with standing over the stove and stirring continuously as the rice soaked in all of the wonderful broth. I loved watching the risotto plump up before my eyes, magically becoming creamy even though there wasn’t any cream involved. To this day, risotto remains one of my favorite things to make. I find it so relaxing to stir the risotto – without any distractions like my phone or laptop, I am forced to take a step back and reflect on the day. I don’t know about you, but I don’t do that often enough. I love playing around with variations of risotto. The lovely Nigella Lawson taught me that you can get quite creative with risotto combinations, and it was thanks to her that I started experimenting more with the dish. I always use the same base and wait until the end to change up the recipe. With my mind on all things pumpkin lately, I decided to try it with risotto. By my second test run of the combination, I knew I had found a huge winner. 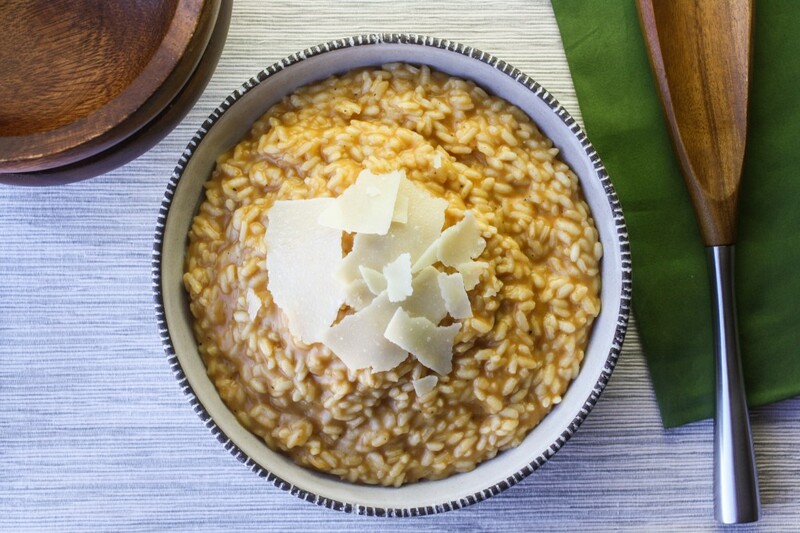 The pumpkin gives a subtle earthy flavor to the risotto and makes it even creamier than usual, while the strong flavor of the parmesan balances out the sweetness of the dish. A sprinkle of toasted pine nuts really ties everything together nicely – I love their slightly soft texture and distinct flavor. The end result is a comforting, warming meal. If you have never made risotto before, please do not be daunted. Really, all you need to make sure of is that you stir the risotto continuously (and the stirring only takes about 20 minutes). I recommend having all of your ingredients and measuring cups set out before beginning the recipe, as you will want to be focused on the stirring. In a medium saucepan, bring vegetable stock to a boil and then reduce heat to medium. In the meantime, add the olive oil and butter to a large saucepan over medium heat. Add the shallot and cook for about one minute; add garlic and cook about one minute longer. Add the arborio rice, stirring until it is coated in the olive oil and butter. Add the white wine and stir until absorbed. Add a ladle (about one cup) of the vegetable stock to the risotto, stirring continuously until the stock is absorbed. Add the next ladle of stock, repeating the process until all of the stock has been added. Once all of the stock is absorbed (about 18-20 minutes), stir in the pumpkin and parmesan. Season with salt and pepper to taste and top with toasted pine nuts. Serve immediately. I bet this is terrific! It’s getting to be the season for pumpkin recipes, too. I’d be even more excited about this time of year if not for the crass commercialization — pumpkin lattes, pumpkin milkshakes, etc. Anyway, your use of it in a comfort-food classic seems just right. It reminds me of pumpkin ravioli in brown butter, which has that same rich earthiness you described. Yours sounds even better, though, with the added nutty flavors. I know what you mean about the pumpkin overload in the fall – I promise you won’t see any pumpkin spice lattes on this blog! I think you’ll like this with the pine nuts and parmesan, which balance out the dish. It’s a very light pumpkin flavor overall. I was just thinking about how all the bloggers are starting to have more fall-inspired meals and then I saw this. 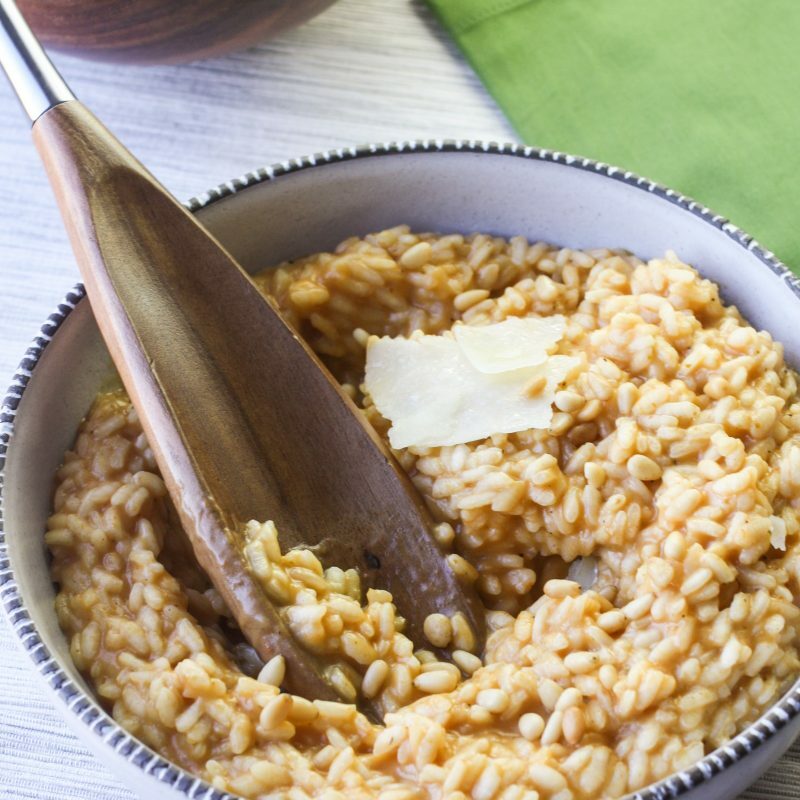 Pumpkin risotto sounds delicious! The sweetness of the pumpkin and the saltiness of the parmesan really seem like they’d go well together. Thanks, Karishma! I hope you like the dish. Me too! I hope you like this version! Julia, I am a fan of your recipes and I love all your writings and stories around them. Monday comes the cold.. I’m making a stop to buy the pumpkin and the rice to be “autumnally” ready. Sounds a very relaxing food. You’re right, Silvia – it is very relaxing to make this dish! I hope you like it! Love the idea of pumpkin risotto. We’re not quite at fall weather here – but will definitely try this as soon as I see the grocery store loaded up with pumpkin puree. Pinning – thanks, Julia! I hope you enjoy it, Geraldine! Just bought the ingredients for this and I’ll make it on Monday, the first day of fall. I can’t wait to taste pumpkin with a bit of parmesan and pine nuts! Let me know how it goes! I think you’ll like it, as the pumpkin is very subtle. Yes, the pumpkin flavor is subtle, but the dish was delicious. I thought the flavors came together really well. I did use toasted walnuts instead of pine nuts, just because I don’t love the latter. Very nice dish that I will make again. Thanks for sharing! Thanks for this recipe! Pumpkin is an ingredient I haven’t used in so long, and this recipe seems perfect to start with! You have a beautiful blog by the way! Thank you, Pia! I hope you enjoy the recipe! That’s great news, Aly! I’m so excited that it’s part of your fall recipe rotation. Fall wouldn’t be complete without a bit of pumpkin, would it? I am so glad you liked the dish, Bonnie! What’s funny is that the first time I experimented with this recipe, it really was too “pumpkin-y”! But when I cut the amount of pumpkin down to just half a cup, it made it much more subtle. I think the parmesan really balances out the flavor too. I’ll definitely try to do some more recipes with wine soon – I love the taste as well! Julia, Your blog is beautiful. The photos and descriptions are so inviting! Now I know at least one recipe is as delicious as it looks and I’m ready to try more! 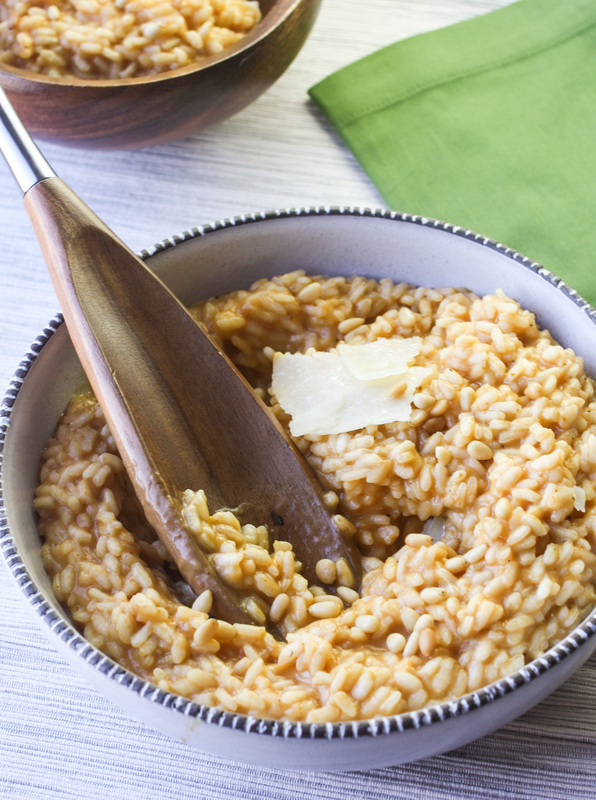 We had the pumpkin risotto and it was perfect for fall. I expect the same greatness from your sweet potato salad recipe, (planned for this week.) Will be looking to your blog when I want to try something new, vegetarian, and delicious. I’m a fan! Good luck to you! Thank you for such a lovely compliment, Pia! I am so glad you enjoyed the risotto. Please let me know what you think of the sweet potato salad, too!